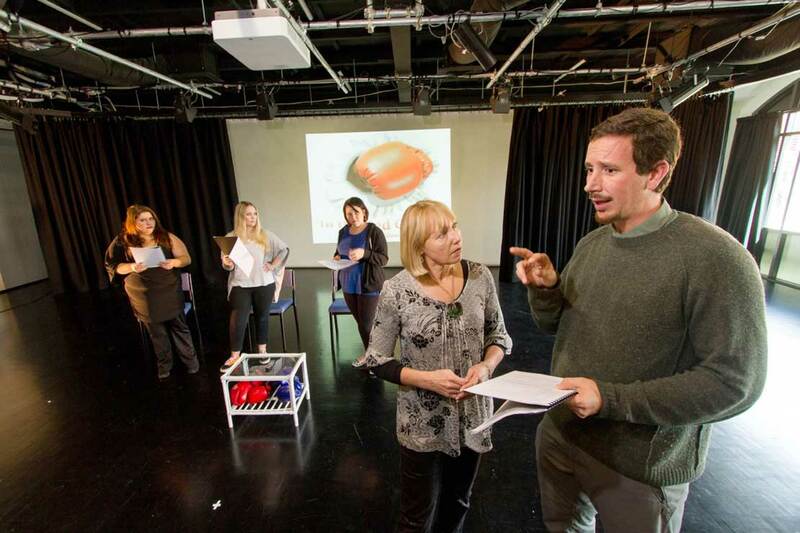 Management lecturer Dr Margot Edwards workshops her play with theatre studies lecturer Dr Rand Hazou and students Amanda Bennett, Sarah Hamilton-Hibbard and Jessie Henderson. Feelings and emotions are often marginalised in the rational world of business, but Massey University’s expressive arts and business programmes hope to change all that with the development of a play about workplace bullying. Dr Margot Edwards, a senior lecturer with the School of Management, wanted to create an effective intervention for dealing with bullying at work. Instead of producing the usual seminar, she decided to write a play. “I wanted to actually create something interactive to get people thinking in a different way about how bullying makes people feel and what the reasons behind it might be,” Dr Edwards says. Now Dr Edwards has teamed up with the university’s theatre studies programme to get her play, titled ‘In the Red Corner’, ready for performance. Students from the Massey University Theatre Society workshoped it through an open reading in the Albany campus’ state-of-the-art Theatre Lab today. School of English and Media Studies lecturer Dr Rand Hazou says the project has been a great opportunity for the business and expressive arts programmes to collaborate. Dr Hazou says the play fits well within the tradition of applied theatre, which he has a particular interest in. “We introduced a new Applied Theatre paper here at Massey last semester – it looks at theatre applied outside conventional performance spaces as a way of bringing about social change. ‘In the Red Corner’ is set in the fictional Blackrock General Hospital and shows the interaction between a bullying director of nursing and a nurse union representative. The content is inspired by the research findings of one of Dr Edwards’ PhD students whose thesis looks at workplace bullying in nursing. Dr Edwards says she first began to think about writing plays after using role play when teaching leadership skills. Down the track, both Dr Edwards and Dr Hazou would like to see Massey offer the services of an acting troupe to businesses, with theatre students being paid to perform thought-provoking plays in workplaces around the country. “If there’s a gap there and Massey can play a role in filling it, fantastic,” Dr Hazou says.